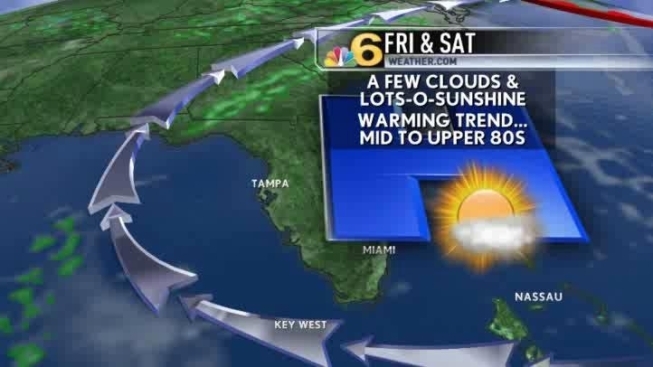 Early temperatures in the 70s will climb to seasonable highs in the low to mid 80s Thursday afternoon in South Florida. It will be partly sunny and pleasant, as shower chances have dropped drastically since earlier this week. It will likely stay dry with just a 10 percent risk of rain, possibly a rogue shower on the breeze. It will not be as breezy as it had been earlier this week, as winds will range from 10 to 15 mph. Since the wind will move towards the shore, from east to west, there is a risk of rip currents at local Atlantic beaches. The weekend looks dry and partly sunny now, with a few more clouds expected Sunday. Be ready for some heat and humidity, as highs both days will reach the upper 80s, with dew points possibly entering the 70 degree range.